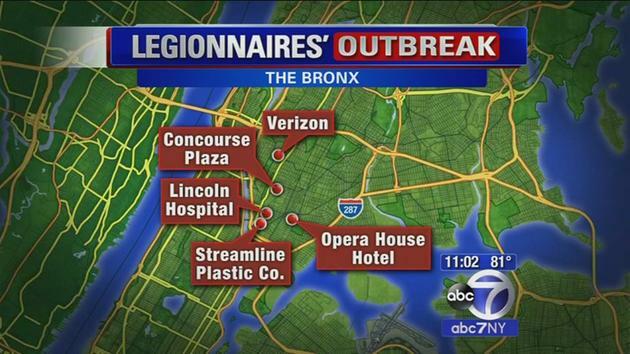 An outbreak of Legionnaires' disease has hit my hometown the Boogie Down Bronx once again. The bacteria were discovered in cooling towers at Lincoln Hospital, Concourse Plaza mall located near the courthouse and new Yankee stadium and were present in other buildings in the south Bronx. Back in January, there was an outbreak at a building in Co-op City near the popular Bay plaza area. The bacteria that causes Legionnaires, Legionella pneumophilia, was found to be present in the building's air conditioning system. It seems history is repeating itself in the Bronx. There have been over 70 cases of Legionnaires disease reported in the Bronx with 7 deaths so far. Legionnaires' disease infects the lungs. Symptoms appear within 3 to 11 days and consist of chills, muscle aches, fever, cough, headache, loss of appetite, diarrhea and vomiting. They are similar to symptoms of the flu. The disease is treatable with antibiotics but can be deadly to those who suffer from pulmonary problems, have a weak immune system and the elderly. Legionella pneumophilia lives in water and spread via inhaled evaporated water. It can live in temperatures ranging from 70 to 120 degrees F.
Residents in The Bronx, especially in the south Bronx are concerned with the spreading of this disease and are complaining at the lack of response by the City. City officials are working on passing laws that will require better maintenance of cooling towers and other systems where bacteria such as Legionella pneumophilia can reside, grow and spread.